Contrary to what numerous media reports seem to suggest, current Spanish emigration is very slight. Summary: Only 2% of Spanish citizens living outside Spain are natives who have left the country due to the crisis, a total of around 40,000 people. This figure in no way supports the alarm stirred up by the media with regard to this phenomenon. Analysis: Over the past couple of years the alarm has been raised in Spain and abroad about the rise in Spanish emigration. Furthermore, those voices consider this emigration to be, in itself, yet another of the evils that are afflicting Spanish society; a waste of the resources invested in education and a threat to the future of Spain’s population. Spanish emigrants who in the 1960s went to central and northern European countries, many of them settling there permanently. Around 2 million people emigrated to Europe between 1959 and 1973. Even though many returned after the oil crisis and, above all, due to Spain’s economic growth brought on by its entry to the EU, a large number of Spaniards settled permanently in Germany, Switzerland, France, Belgium and other countries. At the dawn of the new century, in 2002, right in the middle of Spain’s economic boom, the electoral roll of residents abroad came to 488,000 Spaniards who were over the age of 18 and lived in another European country, most of them in France, Germany and Switzerland. That same census now, in 2013, shows 541,000 Spaniards who are over 18 and live in another European country, which implies a small increase of 53,000, or slightly over 10%. An alternative source, the RSRA (Register of Spaniards Resident Abroad, PERE in Spanish), which was started in 2009, shows the evolution of emigration since the crisis began to have an effect on the international mobility of Spaniards: according to its figures, at the beginning of 2013, in Europe there were 20,204 more Spaniards born in Spain than in 2009 (349,653 versus 329,449). The Spanish emigrants, along with their children and grandchildren, who left Spain throughout the 19th and 20th centuries –particularly during the Civil War and the post-war period– to move to a number of Latin American countries, mainly Argentina and Venezuela. In 2002 the electoral roll showed 483,000 Spaniards over the age of 18 living in Latin America. A great number of the earlier emigrants, however, had lost their Spanish nationality and the so-called Historical Memory Act, approved in 2007, offered them the chance to reclaim it. In application of this Act, 503,000 requests for Spanish nationality have been received, 90% of them from Latin America, and close to 300,000 have been favourably settled, thereby increasing the number of Spanish nationals in Latin America whose presence there has nothing to do with the economic crisis in Spain. Spanish emigrants in any other part of the world, especially the US, Canada and Australia. In 2002 they totalled 79,000 according to the electoral roll, and that figure has now doubled to 167,000 according to the PERE of January 2013. However, only a part of this growth is due to Spaniards born in Spain, the bulk of them being those not born in Spain or in their country of residence, that is to say, they are not the children of previous emigrants. The case of the US, the main destination of Spanish migration after Europe and Latin America, clearly shows that the number of Spaniards that has increased the most is those who were not born in Spain or the US, but in other countries. They are, therefore, people who have acquired Spanish nationality, mostly Latin Americans who emigrated to Spain and then to the US. On the whole, fewer than half of the Spanish citizens living in the US in 2013 had been born in Spain. Latin Americans who migrated to Spain, obtained Spanish nationality and, as a result of the economic crisis, left the country and returned to their countries of origin or moved to another. Statistics record them as being Spaniards living abroad but, in most cases, they cannot be considered emigrants since they live in their country of origin. Source: Register of Spaniards Resident Abroad (PERE). In the figure for Spaniards currently residing in Latin America, 1,107,000 according to the PERE in January 2013, earlier Spanish emigrants are included, as well as two further types of false emigrants: those who have never lived in Spain but are descended from earlier Spanish emigrants, and those who were born in Latin America, emigrated to Spain, acquired Spanish nationality and then returned to their country of origin. These people cannot be considered emigrants either since they live in the country in which they were born. Both groups are indistinguishable in statistical terms. Less than a quarter of the Spanish citizens living in Latin America were born in Spain. They come to a total of 245,000, amongst whom there are a large number of earlier emigrants. Comparing these data to previous results, that allow residents living abroad to be differentiated by country of birth –those of 2009– it can be seen that the number of Spaniards born in Spain and living in Latin America has hardly varied over the past five years. In 2009 they were 238,000, which means the number has grown by 3% (7,000 people). The presence of emigrants from Latin America and other countries of origin (mainly Moroccans) who obtained Spanish nationality and later moved to other countries is also noticeable in Europe, where they constitute the group that has grown the most due to the crisis: 83%. How many Spaniards have emigrated due to the crisis? From the figures above it can be deduced that only a very small part of the total number of Spanish citizens resident abroad are Spaniards born in Spain and who left the country in the wake of the 2008 economic crisis and because of reduced job opportunities. According to the PERE, the number of Spaniards born in Spain and living abroad only rose by 6% –40,000 people– between January 2009 and January 2013, this is to say, the years of crisis. These 40,000 people represent less than 0.1% of Spain’s total population. But it could be the case that the real figure of emigrants is actually larger than that recorded in Spanish statistics because many, especially the more recent cases, do not register in the corresponding consulate and are, therefore, statistically invisible as emigrants. To evaluate the possible under-representation of Spaniards in the country’s emigration statistics it is useful to compare the Spanish data with the statistical offices of some of the main destinations countries: Germany, the UK, France and Switzerland. These four countries make up 76% of the total Spanish emigration to other European countries. According to this comparison, the PERE’s Spanish figures are at times substantially higher than those recorded in the country of destination (in the case of France and Switzerland) and in others they are very close, if not practically identical (the UK and Germany). Sources: INE (Spain); Office for National Statistics (UK); Statistisches Bundesamt (Germany); Institute national de la statistique et des études économiques (France); and Office Federal de la Statistique Suisse (Switzerland). The comparison shows that Spanish statistical sources do not underestimate the number of Spaniards living abroad. Nevertheless, many Spaniards may be, for a short time, trying their luck in other countries and not actually settling there, in other words, not living there long enough to register in their institutions. What could also be happening is that the ‘stock’ figures could be hiding heavy movement, that is to say, that many Spanish emigrants could have left the destination country and been replaced by others. This is what the data regarding Germany and the UK seem to suggest: the inflow of Spaniards seems to rise but the number of residents is not proportionally altered, which implies the outflow of many others. The outflow of foreigners from Germany accounted for two thirds of foreign arrivals in 2011, and half in the case of the UK. In fact, Spanish emigrants in some European countries are fewer today than some years ago. In Switzerland, for instance, the number of Spaniards fell from 77,800 in 2003 to 69,400 in December 2012 (Office Federal de la Statistique Suisse). In France, the population recensement of 2008 recorded 257,315 Spaniards, as opposed to 248,315 in 2010. Most of them are inactive population –retirees– (Institute national de la statistique et des études économiques, France). Earlier Spanish emigrants, and their descendants, who moved to Latin America throughout the 20th century, and Latin Americans who immigrated to Spain, acquired Spanish nationality and later on returned to their country of origin: 1,075,000. Earlier Spanish emigrants in other European countries and their descendants: 606,000. Earlier Spanish emigrants and their descendants in other countries (the US and the rest of the world): 97,000. Immigrants who obtained Spanish nationality in Spain and then emigrated to a country different to their country of origin: 105,000. Spaniards born in Spain and who emigrated to other European countries after 2009: 20,000. Spaniards born in Spain and who emigrated to Latin America after 2009: 7,000. 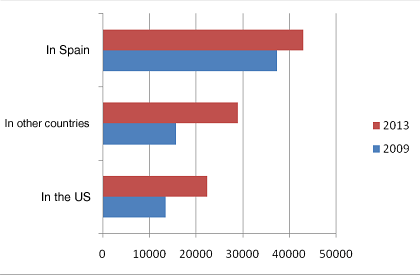 Spaniards born in Spain and who emigrated to other countries (the US and the rest of the world) after 2009: 13,000. On the whole, this means that Spaniards born in Spain who left the country after 2009 only account for 2% of the total number of Spanish citizens living abroad. Conclusions: Spanish society has been exceptionally immobile over the past few decades, since the mid 1970s, when the oil crisis put an end to the wave of migration that began in the 1960s. Compared to the populations of other countries, Spaniards have hardly left their own and even internal mobility, from one province to another, has been very slight since the 1980s, as often reported by those who analyse the Spanish labour market. It is, in short, a locally-rooted society, in which remaining close to family and friends has been a priority for most people. In fact, one of the obstacles to the internationalisation of Spanish companies has been the strong employee resistance against moving to another country. Even the State’s foreign service has come up against the reluctance to move of its own civil servants. Only this sedentary nature can explain the current alarm, which is hard to understand on the basis of actual figures. According to the latter –and they seem reliable– the number of Spaniards who were born in Spain and who currently reside abroad has only risen by 40,000 since the beginning of the crisis, the equivalent to 0.1% of the total Spanish population. It is true that the figures do not include those who leave the country in search of work and not finding what they were looking for return within a few months, but, by definition, only those who reside outside their country of birth can be accounted as emigrants. On the other hand, it is also true that Spain’s immigrant population has dropped by a total of 152,000 since 2009, which is a mere 2% of those who were born in a foreign country and lived in Spain in 2009. However, the number of immigrants still in Spain (6,466,000) more than trebles that of Spanish citizens living abroad. Even amongst the main destinations of the more recent post-crisis Spanish emigration –Germany and the UK, for example– the number of working-age Spaniards residing there is substantially lower than the number of working-age Germans or Britons in Spain. There are 320,000 Germans and Britons between the ages of 15 and 64 in Spain, as opposed to 132,000 Spaniards of those very same ages living in Germany and the UK (INE). To summarise, the inordinate amount of attention the phenomenon is attracting in Spain can only be explained by the fact that it is being looked at from a decidedly local perspective, which is determined to see each job-seeking departure from Spain as something dramatic. Perhaps it would be necessary to change the perspective and ask why it is that a great many more people do not take the step of seeking better working or living conditions abroad. Data from Office for National Statistics (United Kingdom) y de la Statistisches Bundesamt (Germany) and recorded by OCDE in the International Migration Outlook de 2013.